The story of this church begins 120 years ago; but to put it in perspective, let me go back even further. The town of Winchester was formed in 1850, taking as its land what used to be known as south Woburn. By then, the First Congregational Church was already 10 years old and was the only church in town. In the early 1850’s, the railroad was constructed and connected the young town with Boston and its port; economic activity in Winchester grew. Our story picks up about twenty years later and about a mile north of Winchester, on the road to Stoneham in an area known was Winchester Highlands. The people here, being some distance from town, asked that the train stop at Cross Street. The railroad agreed to stop some local trains, but wouldn’t pay to build a station. Aaron Bell offered to build a house next to the tracks, such that the second floor would serve as the train station, the tracks being on an embankment twelve feet above grade. In this house lived Mr. and Mrs George Richardson, who acted as the station agent. In the 1870’s, about ten families began mid-week prayer meetings, held in one of the homes of the families, and led by themselves. 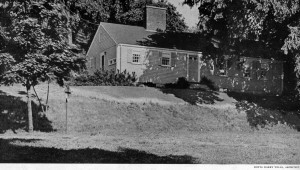 The meetings became well attended and were moved to Lucy Wyman’s house, because it was centrally located and could seat more people. But the attendance continued to grow, and a committee was appointed to find a larger place to meet. The committee tried to rent the Washington School (later to become the New Hope Baptist Church and still standing today), but the school committee said no. Then they worked an arrangement to meet in the train station. As the prayer meetings grew, there was a desire to have a Sunday School. And so, on May 8, 1881 they organized the school and began Sunday afternoon meetings of the school in addition to the Tuesday evening prayer meetings. These meetings attracted the other clergy in town, from the Congregational, Baptist, and Methodist churches, who helped lead services on a rotating basis. In 1882, the Ladies Bethany Sewing Society was formed to support these religious activities and almost immediately they began pushing for the construction of a chapel for the services. So it came to be, in early June of 1886, that a meeting was called by warrant of the justice of the peace to form a religious society, organized as a corporation and called the Highlands Bethany Society. At a second meeting, they drew up a constitution and, at a third meeting, they appointed a building committee. This committee bought land on Cross Street and built a building called Union Chapel (a reflection of the many denominations that came together there). The new chapel was dedicated in Sept 1887 with no indebtedness (thanks largely to the women) and with eleven teachers and an average Sunday School attendance of 70 persons. There are records of the Sunday School holding a “harvest fair” to raise money for the Home for Little Wanderers. The good news did not last forever. They invited clergy and lay persons to lead their services, which worked well at times, and not well at other times. They instituted a weekly pledge of the members so they could pay for services. They had a succession of part time leaders, including two women, at different times, to help with visitation and leadership, and they even sought students from the Boston University School of Theology. But it got harder to provide and organize. So in 1902, they decided to give all their property to the First Congregational Society. This was a discouraging time for the Highland Bethany Society, but not a defeat. Some of the member of the Highland Bethany Society were also members of the First Congregational Society and wanted some consolidation in time of need. Anyway, Rev Newton of the First Church took an interest in the Chapel and personally led some Tuesday evening meetings and arranged for leadership of the Sunday services. In 1905, he assigned an assistant minister, named Reverend CharlesDwight, to take charge of the Highlands Chapel. In short order, Dwight saw the need for a church organization (or reorganization) and held a series of meetings in early 1906. So, on March 13, 1906, the Highlands Bethany Society became the Second Congregational Church. At three in the afternoon, a council of 16 churches from the vicinity met in the Highlands Chapel. This council, called by the First Church, recognized the Second Congregational Church. Later that day, after a some food provided by the ladies, Rev. 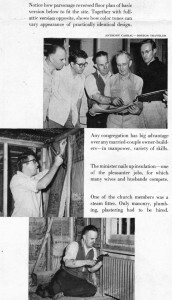 Dwight was installed as the first pastor. There were 56 charter members on the rolls of the church. The deed to the property was returned from the First Church and the new church was officially incorporated on April 3, 1907. Rev Dwight stayed through 1909; Isaac Osborne served from until 1911, William Fryling served until 1917. Then began a series of acting ministers and pulpit supply lasting five years. It must have been a time of discouragement again. In November 1922, Rev John Whitley, who had been acting minister for six months, was called as the settled pastor and things looked up. In 1923, a building committee was appointed. A lot was purchased on Washington Street and in Nov 1925 the ground was broken for a new church building. Of this ceremony we have photographs. The first shovelful of dirt was dug by Mary McElhiney, a charter member of the church. On Palm Sunday 1926, they laid the cornerstone and on November 14th, they dedicated their new building. 1950: parsonage built under the general direction of Henry Clark. 1950: painting from Hemroulle, France presented to Winchester churches. superintendent John McLean (who lived at 8 Kenwin Road).